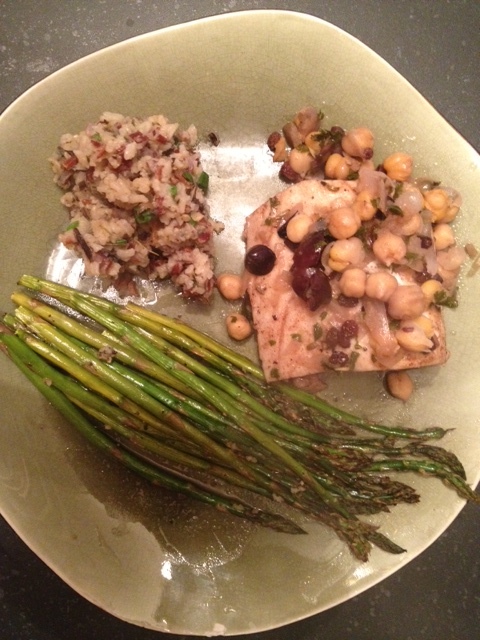 Steamed Fish with Chickpeas and Currants | Om nom nom! Place a large straight-sided pan with a tightfitting lid over medium-high heat until hot. Add 1/4 cup of the oil, the cumin, cinnamon, and sumac and cook, stirring, until aromatic, about 30 to 60 seconds. Remove the pan from heat and immediately transfer half of the oil mixture to a large, shallow dish. Let cool slightly. Season the fish fillets all over with salt and pepper, transfer them to the shallow dish, and turn them to coat all over with the spiced oil. Cover and refrigerate for 30 minutes. Meanwhile, return the pan with the remaining spiced oil to medium-high heat. Add the onion and fennel, season with salt and pepper, and cook, stirring often and lowering the heat if needed, until the onion is translucent, about 5 minutes. Add the wine and currants and simmer over medium heat until the wine is nearly evaporated, about 3 to 4 minutes. Stir in the chickpeas, clam juice, olives, 2 tablespoons of the cilantro, and the chopped preserved lemon and bring to a simmer. Cook until the liquid is reduced by two-thirds and the chickpeas are tender, about 6 minutes. Taste and season with additional salt and pepper as needed. Remove from heat and set aside until the fish has finished marinating. Place the remaining 1 tablespoon olive oil in a small skillet and set over medium heat. Once the oil shimmers, add the preserved lemon slices and sear until caramelized, about 3 minutes per side; set aside. Return the pan with the chickpeas to medium heat. Tuck the fish into the chickpea mixture and place 3 slices of preserved lemon over each fillet. Cover and cook at a lively simmer until the fish flakes when cut into, about 10 minutes for a 3/4-inch-thick fillet or 12 minutes for a 1- to 1-1/4-inch-thick fillet. Sprinkle the remaining tablespoon of cilantro over the fish. To serve, place a fillet in a shallow bowl, followed by a large spoonful of chickpeas.